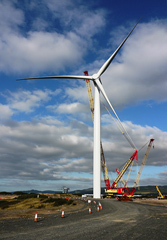 UK: Siemens' 6MW turbine has been installed at the Hunterston Test Centre for Offshore Wind in North Ayrshire, Scotland. The 24MW Hunterston demo project, which is being developed by utility SSE and Scottish Enterprise. Three turbine prototypes will be tested and developed over five years. This includes Siemens SWT-6.0-154 turbine which features a 154-metre rotor diameter and a direct drive generator. The German company will carry out final tests at the site before going ahead with production of the turbine for the UK and international markets. Delays have taken place in the construction of the foundations due to difficult ground conditions for the second turbine, Mitsubishi's 7MW SeaAngel. A third turbine, from another supplier, will be installed on the Scottish Enterprise-operated berth. Jan Kjaersgaard, Siemens Wind Power Europe, Middle East and Africa business unit CEO, said: "The United Kingdom is backing our technology in a particular way. "That’s why we are seeking to collaborate with the country’s power suppliers right from the product development stage through to commissioning. We are focused on making a visible contribution to the UK’s economy." Three blades on one of the Siemens 6MW turbines at the 12MW Gunfleet Sands 3 offshore wind site, south east England, were replaced after being damaged during testing in August. Siemens is opening a new hub in Scotland in October to support its UK onshore wind business. Based in Livingston, near Glasgow, 30 staff will manage onshore projects in England, Scotland and Ireland. They will coordinate construction, installation and environment, health and safety operations.